More and more people are seeking alternative treatments for depression. Whether people dislike pharmaceutical antidepressants (e.g. SSRIs) because of the side effects, the dependency, or they are just following the alternative medicine movement, alternative treatments for depression are on the rise. Among many other alternative treatments, acupuncture has shown some promising results for the treatment of depression according to recent studies. For example, a study published in 2013 suggested that acupuncture was equally as effective as counselling for the treatment of depression . Since there is little risk for any adverse side effects, it is certainly worth a try. Even if you are advised to stay on your antidepressant medications by your healthcare practitioner, acupuncture can still be helpful to both cure your depression more effectively and help manage the side effects of antidepressants (e.g. sexual functionality) . This article will explore the common acupuncture points used to treat depression and how you can use these points any time using acupressure. How Can Acupuncture or Acupressure Be Effective for The Treatment of Depression? According to Traditional Chinese Medicine (TCM) theory, depression is the result of a qi (energy) stagnation. Specifically, a liver qi stagnation. Qi, which is pronounced as chi, can be simply defined as energy, oxygen, or the breath—it is the flow of life within us. The liver is specifically in charge of the movement of qi throughout the body. Emotions such as anger or depression can create liver qi stagnations. Conversely, liver qi stagnations can similarly trigger depression or anger. In a nutshell, the liver harmonizes our emotions according to TCM . points along our qi meridians which are channels that qi flows through. 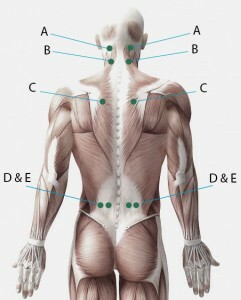 Each point corresponds to something in the body. When an acupuncturist inserts a needle into a point, they are in theory restoring the natural flow of qi by removing qi blocks or stagnation. Sometimes when a qi stagnation is worse than normal, acupuncturists can attach the inserted needles to a machine that delivers very small amounts of electricity in hopes to restore the normal flow of qi. Needles, however, are not the only option, If you wish help move your stagnant qi yourself, you can practice acupressure. 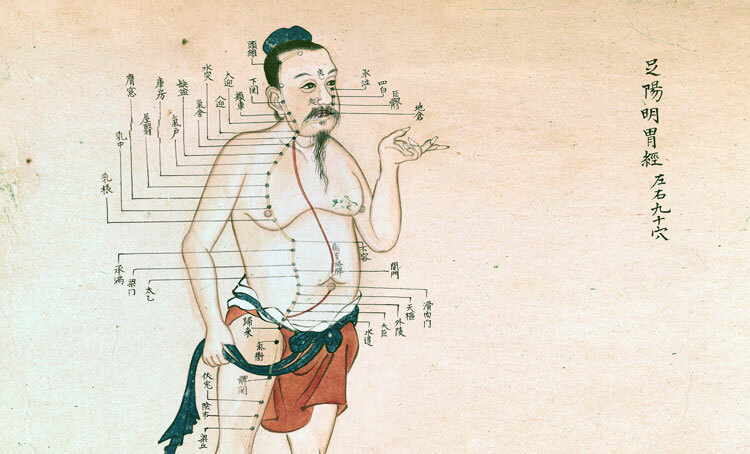 Acupressure, as the name implies, uses pressure instead of needes to manipulate qi. Scroll past the list to read about how to practice acupressure. Use this list to find the points on your own body if you want practice acupressure on yourself. Located below the base of the skull in the depressions between the two large neck muscles. The Gates of Consciousness are commonly used for depression, headaches, dizziness, stiff necks, and irritability. Located ~half an inch below the base of the skull on the muscles half an inch out from the spine. The Heavenly Pillar is commonly used for emotional imbalances, exhaustion, depression, and neck fatigue. Located between the spine and the shoulder blades. The Vital Diaphragm is commonly used to relieve stress, balance the emotions, and relieve anxiety. 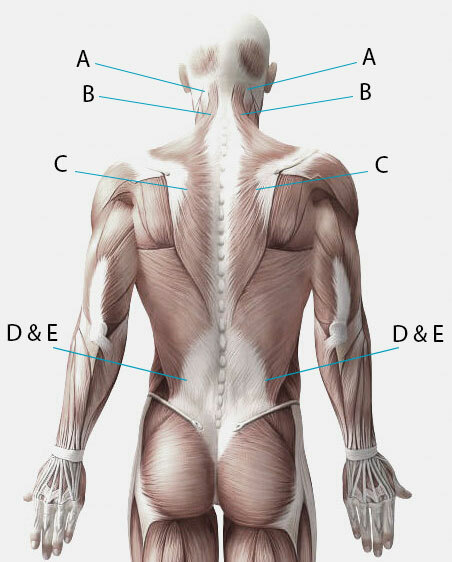 Point D (B 23) is located two finger widths out from the spine and point E (B 47) is four finger widths out from the spine. The Sea of Vitality is commonly used to relieve depression, fatigue, and exhaustion. *Never press on areas where you have disc problems, broken bone, or other similar injuries. Located directly between your eyebrows where the bridge of the nose meets the middle of the forehead. The Third Eye is commonly used for depression and gland imbalances. Located in the depression between the first rib and collar bone immediately outside of the breast bone. The Elegant Mansion is commonly used for depression, chest congestion, breathing difficulties, and premenstrual tension. Located four finger widths up from the armpit crease and one finger width inward. The Letting Go points are commonly used to relieve depression, repressed emotions, chest tension or congestion, and skin disorders. Located on the center of the breast bone three finger widths up from the base of the breast bone (xiphoid process). The Sea of Tranquility is commonly used to help depression, nervousness, chest congestion, and emotional imbalances. Located four finger widths below the kneecap and one figher width to the outside of the shin bone. The Three Mile Point is commonly used to strenthen the whole body, tone muscles, balance emotions, and depression. If acupuncture is outside of your budget or you just want to save time, you can always do it yourself with acupressure which produces similar results. 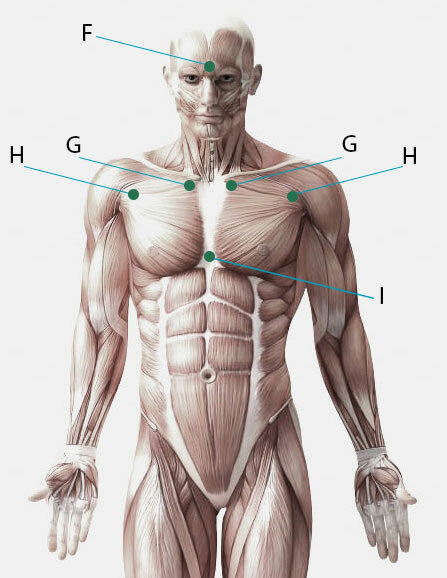 In acupressure, you simply identify which points you need to work on (which will be shown below) and apply modest pressure to these points with your finger(s), thumb(s), side of the hand, palm, etc. The most difficult part is identifying where the points are located on your body. With practice you will get much better at honing in on the exact location of each point. Sit yourself in a quiet and relaxing environment. Take some deep breaths. Meditation beforehand would be helpful but it is not necessary—it will help you be more in touch with your body. Then find the qi points of interest. Remember to pay attention to the details so you can be as accurate as possible. Once you find the locations on your body, press very lightly on one or two of the points. You can sometimes hit two points at once with both hands such as with the Gates of Consciousness. Once you are settled and fully positioned, you can apply more pressure (it’s a general rule to apply medium pressure—do not press as hard as you can). While still applying pressure, make small gentle circles in the location. Apply pressure for up to 2 minutes for each point. As you get experienced, you will begin to notice when the qi begins to flow again and you will be able to notice where qi stagnations are. Speaking from personal experience, when you get to this point, it is a great feeling. When you do it enough, you may find yourself pressing on points without even being aware of it. I catch myself doing this all the time! Remember to listen to your intuition. You may experience some pain. This is normal and sometimes is explained to be the qi stagnation in your body. The pain, however, should not be excruciating. Stop if the pain is too severe. Drink plenty of warm water following an acupuncture or acupressure session to help clear away toxins in the body and promote the flow of qi. According to TCM theory, it is important to classify the type of depression you or someone is experiencing to properly treat it and identify the most effective points. If you are seeking to refine your acupressure skills, try to identify which form of depression fits you best and then work on the points with acupressure. If you want to get serious about learning the points or practice acupressure on yourself, you may want to experiment with the points associated with the different types of depression. The list can be found at the Yin Yang House website. Please share this article & support our cause to help people live healthy and happy lives! Feel free to comment below with and questions, comments, or suggestions. Read this disclaimer before using any of this information or attempting self-treatment. Always consult a doctor before utilizing any information on this website. Any information here is strictly for educational purposes only.